From now on, I will write about my Sunday's best that I showcase every weekend. I'll label the posts as modest clothing to give my share of modesty fashion campaign. But before that, I'd like to share that I had a wonderful time in visiting one of my favorite travel destinations, Dapitan City. We traveled there through Rent a Car Philippines travel arrangement because it's a group tour. I'll definitely visit the place again with my husband. 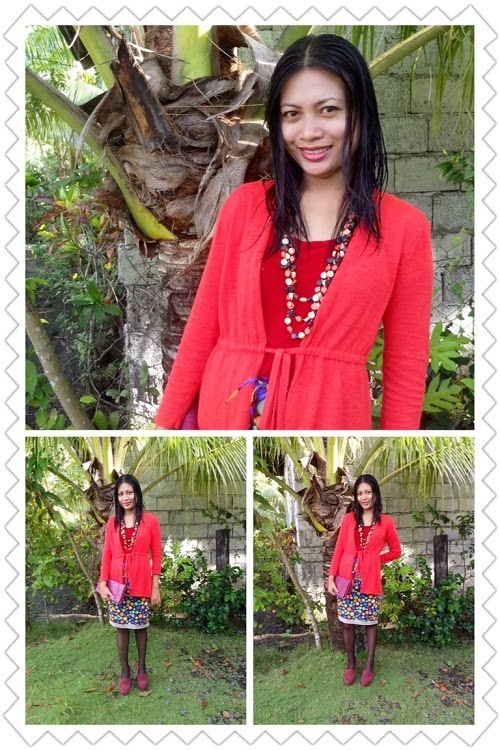 Last Sunday, I chose a more colorful style. It's a way to say goodbye to the color of the year theme that is tangerine tango. I wore a knee-length skirt teamed with a spaghetti strap shirt. To add drama to the outfit and to cover my shoulders, I donned a chic Old Navy blazer. To highlight my blouse, I wore my edgy shoes from Primadonna and emphasized it with black stockings. I know that I wore an over-the-top outfit but I really like the color palette of the style. The long necklace is a gift from my husband.